After studying violin, composition and conducting at the Prague Conservatory, Karel Ančerl came to the attention of the great Czech conductor Václav Talich, whose disciple he became. Hermann Scherchen appointed him as his assistant, a position he held from 1929 to 1931, first in Berlin and then in Munich. On 16 April 1944, Ančerl was deported to Auschwitz with his wife and son. He alone survived. After the liberation he returned, very weakened, to Prague, where he resumed leading the Prague Radio Symphony Orchestra, and went on to conduct the Prague State Opera Orchestra until 1950. At the end of that year, Ančerl was appointed chief conductor of the Czech Philharmonic, succeeding Talich, who had been relieved of his duties. Under his baton, the Czech Philharmonic became one of the best orchestras in the world. 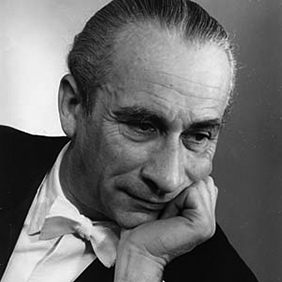 After the Prague Spring of 1968 and the ensuing Soviet occupation, Ančerl chose to work with the Toronto Symphony Orchestra. Great soloists such as Mstislav Rostropovich, Glenn Gould and Henryk Szeryng performed with him. He was a regular guest conductor with the Concertgebouw Orchestra in Amsterdam, leading it ten or twelve times between 1966 and 1970. Ančerl died of cancer in 1973 in Toronto.